This Fool thinks it is finally time to cash out on one of his biggest winners of all time. I've been an Apple (NASDAQ:AAPL) fanboy for nearly two decades, so this is a bittersweet article for me to write. In my house, you'll find two iPhones, three iPads, an Apple Watch, an Apple TV, and an iMac. My three young children literally have no clue how to use Microsoft Windows. My love affair with Apple's products convinced me to become a shareholder in February of 2010. I made several more purchases in the ensuing years. My average cost basis is about $35 per share. With the stock currently hovering around $193, buying and holding Apple ranks as one of the smartest financial decisions that I've ever made. And yet, despite my long-term devotion to Apple's products and stock, I've concluded that it's finally time for me to move on. Here are 10 reasons why I've decided to cash in all of my chips. Apple's market cap is $949 billion as I type this. That makes it the most valuable publicly traded company in the world. Long-term shareholders like me have already won big by owning this stock. The downside to Apple's gargantuan size is that it's going to be extremely difficult for the stock to produce multibagger returns from here. Fool co-founder David Gardner coined the term "the megacap multiplier obstacle" to describe this principle many years ago. The idea is that it becomes harder and harder for a company to double in value as it increases in size. Consider this: Even after factoring in hundreds of billions in additional stock buybacks, Apple's market cap would probably have to reach $1.7 trillion or so for the stock to double from here. I vividly remember buying my first iPhone. I happily switched from a BlackBerry Storm -- which was a piece of junk -- the day that the iPhone became available on Verizon Communications' network. Switching was an amazing experience. The iPhone was fast, intuitive, and extremely useful. I was so happy with my decision that I convinced my wife to become an iPhone user soon after. We both happily jumped on the iPhone upgrade cycle. We were happy to pay up to get our hands on the latest iPhone as soon as we qualified for an upgrade. Unfortunately, the charm has worn off. We eventually realized that we use our iPhones primarily for text messaging, taking pictures, browsing the web, posting to Facebook, and listening to podcasts. Our current iPhone 6s handles all of these tasks just as well as a brand-new iPhone X. Paying hundreds to upgrade every two years now just seems like a waste of money. It's a similar story for our other Apple products. Our iPads, Apple TV, and iMac were all purchased years ago and continue to function flawlessly. Our revised upgrade strategy is to buy used Apple products that are at least two generations old off of sites like eBay, glyde.com, or gazelle.com. Aside from a few small hardware differences, we can barely tell the difference between these new-to-us models and our old products. They are functionally identical. I have no doubt that millions of other loyal Apple users have reached the same conclusion. If my assumption is true, then it will act as a major drag on unit sales volume growth for many years to come. That's a big problem since the vast majority of Apple's revenue is generated from the sale of brand-new products. While Apple's portfolio has become more diversified over time, the iPhone still accounts for more than 60% of total revenue. That means that top-line growth will be driven by two primary levers for the foreseeable future: iPhone unit volumes and average selling price. I have a hard time seeing the company producing meaningful unit volume growth from here. The company sold 217 million iPhones in the last 12 months. Since there are only so many consumers around the world that can afford to buy a brand-new iPhone in any given year, moving this number higher is going to be very challenging. That's especially true since Mary Meeker's must-read 2018 Internet Trends report just showed that worldwide smartphone shipment volumes were flat in 2017. This likely means that Apple's most important lever for driving iPhone revenue growth is the average selling price. On this front the company is currently doing phenomenally well. Last quarter Apple reported unit volume growth of just 3%, but total iPhone revenue actually grew by 14%. The big difference between those two numbers is largely owed to surging average selling prices thanks to the recent launch of the ultra-premium iPhone X. This leads to the question: Will Apple still be able to sell enough ultra-premium iPhones to keep its average selling price so high? It's possible, but I think that skepticism is warranted since iPhone X demand appears to be weaker than the company was expecting. If iPhone average selling prices do flatline (or fall) and unit volume growth stalls, then Apple is going to struggle to move its top line higher. Apple bulls have been pointing to the company's massive overseas cash hoard for years as a potential catalyst. The idea was that Congress would eventually change its repatriation tax policy that kept the vast majority of Apple's cash trapped overseas. Once the law was changed, Apple would be finally able to use its mountain of cash to reward shareholders. Well, now that the lower repatriation rate has been announced, Apple CFO Luca Maestri recently said that the company's goal is to become cash neutral over time. Getting there will require spending hundreds of billions on buybacks, which is great news for shareholders. However, since this news is so well known, I think it is reasonable to assume that this catalyst has already been priced in. While Apple has a history of slowly entering new markets -- there were plenty of other smartphones, tablets, and smartwatches available before the iPhone, iPad, and Apple Watch were introduced -- I think there are reasons to worry that Apple won't be successful with its delayed entry into the home-speaker market. This market is already flooded with popular products made by Amazon (NASDAQ: AMZN) and Alphabet (NASDAQ: GOOG)(NASDAQ: GOOGL). These companies sell a range of cheap products that are supported by vast ecosystems that make them highly attractive to consumers. Will the superior sound quality of the HomePod prove to be enough to convince consumers to pay a big premium to own it instead of the current market-leading devices? While that can't be ruled out, the early signs are not very encouraging. Warren Buffett recently took investors by surprise when SEC filings showed that his Berkshire Hathaway he had been buying Apple's stock hand over fist. In fact, it's bought so much Apple stock that it has officially overtaken Wells Fargo as Berkshire Hathaway's largest publicly traded stock position. 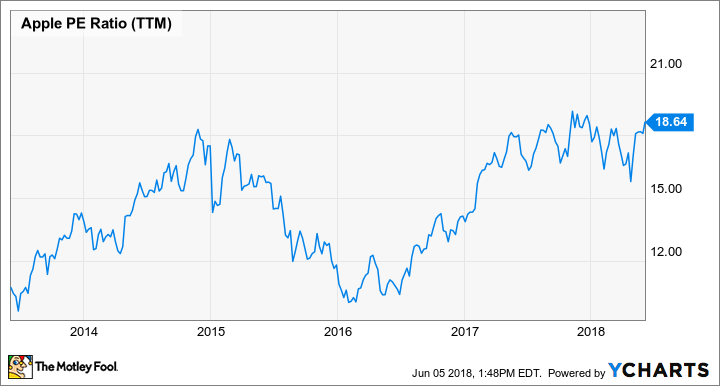 While it is great to see such a huge vote of confidence from Buffett, I think that his interest in the stock is at least partially responsible for Apple's recent P/E ratio expansion to a five-year high. AAPL PE Ratio (TTM) data by YCharts. Will Buffett's blessing allow Apple to sustain its higher valuation in the years ahead? It's possible, but that theory didn't hold up when Buffett took a meaningful position in IBM a few years ago. Apple bulls will point out that even after the recent run, shares trade for "only" 18 times trailing earnings. That seems to be low when considering that the average company in the S&P 500 currently trades for about 25 times trailing earnings. The mismatch makes no sense to many investors since Apple is clearly a better company than the average business. For the longest time, I couldn't figure out why the market wouldn't award Apple an above-average multiple either. However, I've since changed my tune and now fully agree that Apple deserves to trade at a below-market multiple. Why? The reason is that Apple is a tech hardware company at its core. The vast majority of the company's revenue and profits are made from selling brand-new iPhones, iPads, iMacs, and other electronic products. This means Apple has to continually refresh its product lines with brand-new features that continually convince customers to stay loyal and upgrade. If new products fail to capture the public's attention -- or even just don't sell as well as a previous model -- then Apple's revenue and profits would fall hard. Thus far Apple hasn't had any problems convincing millions of customers to buy its new products in droves as soon as they come out. But will this still ring true three, five, or 10 years from now? That's awfully hard to say since the tech world moves fast. This omnipresent uncertainty is likely to be a major reason why Wall Street consistently keeps Apple's P/E ratio so low. Since this situation won't change anytime soon, I have a hard time believing that Apple's current P/E ratio of 18 means that its stock is "cheap." In fact, I think there's an argument to be made that today's valuation is actually quite generous, especially when compared to what this company's P/E ratio has been over the last five years. I love dividends and stock buybacks as much as the next investor, but I have a hard time getting excited about owning a business that relies heavily on financial engineering to drive earnings growth. FAANG is an investing acronym that stands for Facebook, Amazon, Apple, Netflix, and Google (Alphabet). These super-high-quality tech stocks have crushed the market for many years, and many investors view them as must-own stocks. I've personally owned all the FAANG stocks for many years, but I'm starting to worry that they have become too big (and too popular) for their own good. Collectively, these stocks make up about 30% of my portfolio. When I force myself to rank these businesses based on my conviction in their staying power and growth potential, all the factors listed above cause me to put Apple in last place. Selling off all of my Apple stock now will bring down my overall exposure to this group of stocks. I find that idea to be appealing. My Foolish colleague Brian Stoffel recently published a fantastic article on how to know when it is time to sell a stock. The No. 4 reason on his list was "there are better places for your money." Since I believe that Apple's current valuation is generous and that the company is going to struggle with growth over the next few years, I think that reallocating this capital elsewhere makes a great deal of sense. Hubspot (NYSE: HUBS) -- A software-as-a-service provider that is pioneering the shift toward "inbound" marketing. HealthEquity (NASDAQ: HQY) -- A fast-growing company focused on Health Savings Accounts that boasts three sources of recurring revenue. Axon Enterprise (NASDAQ: AAXN) -- The leading provider of Taser stun guns, law enforcement body cameras, and evidence-management software. Paycom Software (NYSE: PAYC) -- A founder-led payroll-processor company that is gobbling up market share. Adobe Systems (NASDAQ: ADBE) -- The company's push to the cloud is driving double-digit gains in revenue and profits. AppFolio (NASDAQ: APPF) -- A software-as-a-service provider focused on servicing business owners in several niche markets. BlackLine (NASDAQ: BL) -- A software company that is attempting to bring the accounting process into the 21st century. All seven of these businesses are poised to deliver double-digit organic revenue and profit growth over the next five years. That's a prospect I find quite enticing, and I think the odds are very favorable that they'll outperform Apple as a group from here. I'll readily admit that a lot of my analysis could prove to be dead wrong. Apple's valuation might stay high "forever" now that it has the blessing of Buffett. New iPhone models could help Apple to take market share, and average selling prices might remain very strong. Apple might also enter a brand-new product category in the near future that sends revenue and profits to all-time highs. Still, given Apple's gargantuan size, the risk of slowing growth, its generous valuation, and the huge list of other stocks that I'd rather own instead, I can't help but feel that ringing the register finally makes sense. That's why I plan on selling all of my Apple stock as soon as The Motley Fool's trading rules allow.